← 50 Days To Go! This past week more than any other week of training was about trying to balance my training schedule against a busy life calendar. Fortunately, I realized last week that it would be beneficial for me to push forward with two high distance runs two weeks in a row because of how busy I knew this past week was going to be. Although my body paid for the decision during week 11, my sanity is beyond thankful for that choice! Because of how hard I pushed myself during week 11, I decided to take the beginning of week 12 pretty easy. Instead of doing a maintenance run on Monday, I opted for the elliptical instead, which gave my legs a much needed rest. Late last week I started foam rolling for the first time, which seems to have been a success as my hamstring is feeling much better this week than it did during and after last week’s nine miler. My training plan called for a lot of walking this past week, which included the St. Jude Give Thanks Walk on Saturday, and I ended the week with a “short” four mile run yesterday. Its funny to think about how four miles is starting to feel “short,” but its good that its starting to feel that way since starting during week 13 my training plan calls for me to increase one of my weekday runs to 30-45 minutes from 30 minutes, which has been the length of both of my weekday runs up until this point of my training. 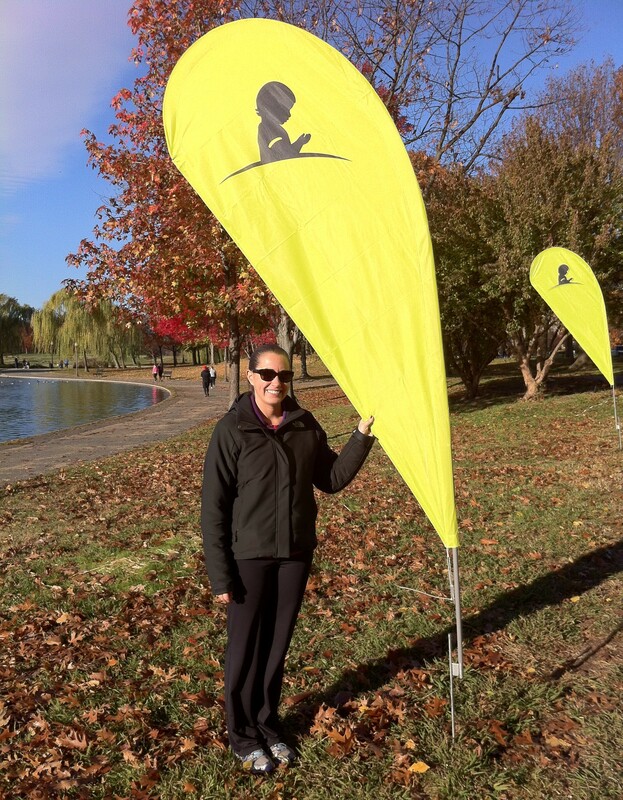 Although the adjustments to my training plan allowed me to take maintain my week 11 mileage instead of increasing it, I faced my first major temptation over the weekend to not complete my long run. I had a very hard time getting up for work this morning because of how much fun I had over the weekend, which included dinner Saturday night with friends and my first football tailgate on Sunday at the Ravens game. Although I didn’t drink at the tailgate, I ate a lot of food (including paella – yum! ), and by the time we got home Sunday afternoon I was exhausted. Fortunately, a nap on the couch was all I needed to find the energy and motivation needed to complete my four mile run last night. 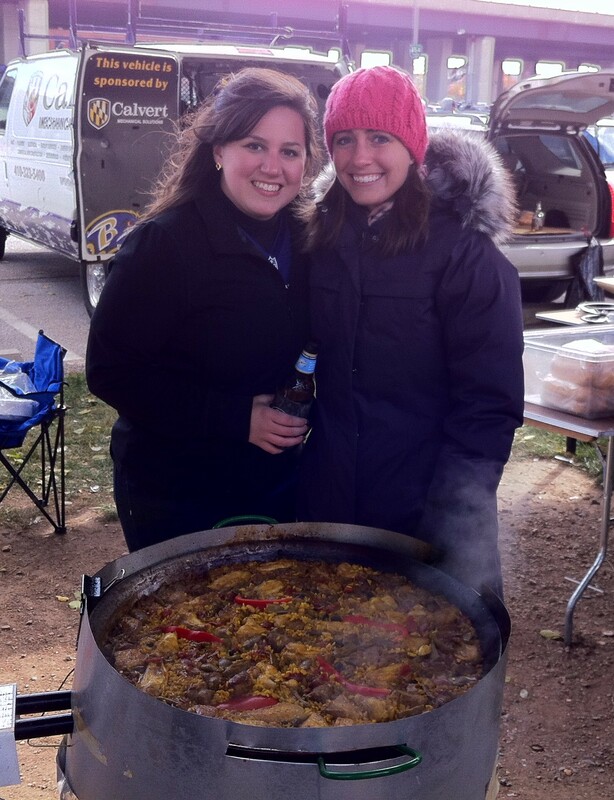 Despite the 30 degree weather and high winds, Sunday’s Raven’s tailgate and paella feast was a blast! This coming week includes travel and Thanksgiving, so once again I’ll face temptation to not complete all of the miles in my training plan. Preston and I aren’t leaving for Thanksgiving until Thursday morning, and since school ends two hours early on Wednesday I shouldn’t face any difficulty getting in my two weekday runs this week. However, we’re supposed to put in a significant amount of walking on both Friday and Saturday, and then I face a 10 mile run on Sunday. Hopefully all will go according to plan and I will have positive news to report next week for week 13! QOTD: How do you adjust your training in order to balance your “real life” and your “training life”? This entry was posted in Training, WDW Half Marathon Training and tagged Disney World Half Marathon, elliptical, foam rolling, half marathon training, half marathon training plan, powerwalking, resistance band, running, St. Jude Give Thanks Walk, training, training plan, treadmill, walking, weekly recap, weight training. Bookmark the permalink. The paella was so yummy! Lots of delicious seafood, meat, and veggies!